Nasir Safdari, a software engineering masterâ€™s student from Afghanistan. 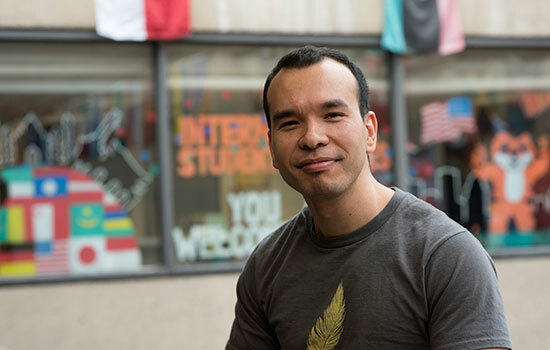 After graduation, he hopes to go back to Afghanistan and promote computing careers for women. Nasir Safdari remembers the first time he saw a computer in-person. Growing up as an Afghan refugee in Iran, Safdari didn’t touch a computer until the day his seventh-grade teacher was able to purchase one with his own money. That summer, Safdari learned to change the background from black to green in the MS-DOS operating system and how to open a JPEG. “I felt really cool,” he said. After graduation this May, Safdari hopes to instill that same wonder about computers in young people back home in Afghanistan. Specifically, he wants to create a center that helps train high school and college women for careers in the computing field. Safdari developed the idea along with other international students who came to the U.S. through the Fulbright scholarship program. He credits those friends for telling him about RIT. While at RIT, Safdari completed a thesis on bug localization. By creating a tool, he is working to make the time-consuming and costly process of identifying source code problems automatic. The tool uses machine learning and natural language processing to recommend and direct programmers to places where that type of bug might occur. While he plans to eventually continue working on his thesis project, right now he feels a pull to Afghanistan, where he can develop the center and work with the government to improve the country. “I personally would like to work with government agencies because you know that your work is going to make a bigger change,” said Safdari.